Looking for the perfect summer cocktail? 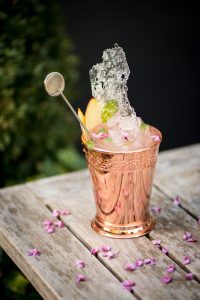 Atlas, located inside the St. Regis Hotel in Buckhead, created a version of a julep that has complexity and balance while still being light and refreshing. Instead of steeping the fruit with the bourbon, the freshness of the peach flavor is captured in a more modern fashion through vacuum sealing the fruit with the Maker’s Mark. By infusing the bourbon with peaches, you can get a more consistent fruit flavor from first sip to last, without adding too much viscosity. It is perfect for a warm Georgia afternoon. Muddle mint leave and peach syrup in a cocktail shaker; add bourbon, lemon, and ice. Shake well. Double strain into a Julep cup that has been packed with crushed ice. Garnish with Peach slices and fresh mint. In a small saucepan, place one cup of water, one cup of granulated sugar and one peach, thinly sliced. Bring to a boil over medium heat, reduce heat to low and simmer 30 minutes. Strain first through a wider mesh such as a china cap, pressing peaches to extract all juice, then double strain through fine mesh. *To infuse Maker’s Mark Bourbon with peach; estimate one ripe peach per cup of bourbon. Slice peaches and cover in bourbon in a vacuum seal bag. Vacuum seal and let sit one day. Finally, for more information or to make a reservation, visit atlasrestaurant.com. Atlas is located at the St. Regis Atlanta at 88 West Paces Ferry Rd NW, Atlanta, GA 30305. You can also stay connected on Twitter and Instagram at @AtlasBuckhead and on Facebook at www.facebook.com/AtlasBuckhead/.